On the website of Musicmeter someone called Chevy93 has a hobby that I gave up on over 30 years ago: lists of favourite albums. He invites all participants of the website to send in their favourite 30 albums of the decade and from there goes to work to come up with the ultimate list of those participating. I decided to join this year and put in some effort to think up all the albums that I like a lot from this decade, the decade that I musically matured. As in discovering albums and at the end of the decade having the money to buy them as well. Whole musical worlds opened. You will find a lot of my favourite albums of all time in these few years, as they made a large impression on me. I bonded with them, because possessing little albums makes the relationship with those albums extremely special. They're sort of ingrained in me as they were placed on a nearly empty brain. A brain that was filled only with songs, not albums. Most of the albums below I bought in or just after the 70s, with two exceptions: Led Zeppelin. I bought all the cds in the 90s in my third round of appreciation of the band. The first being the singles, the second the mid-80s the albums on taped cassettes; and Big Star. Did anyone know the band at the time? It may well be that I forgot about an album or two. There's only so much time to put in here. So let's go. Extremely moody and grotesque with some great songs, 'Sketches of China' up front. In between Airplane and Starship Kantner and Slick are in great form. Need I say more. This album holds everything, with one of the most adventurous singles ever and most songs are just as adventurous. Supertramp's best album by far, with two of its best songs 'School' and 'Dreamer'. An epic album without a single slip. Heart's first album containing the first two hits, but also showing the folk roots of the sisters Wilson and their male companions that are allowed to shine through. Together 'Dreamboat Annie' is a beautiful mix of rock and folk. And were the girls Wilson pretty? Oh, yes. Punk and new wave came to The Netherlands as well. Gruppo Sportivo is more an, extremely clever, musical joke that punk. Hans van den Burg mixed all his influences into his songs. Songs that he never surpassed. With the high voiced female companions José and Marijke in tow, this band from The Hague produced a winning album. Eric Clapton had the blues major and found people to play it with as loud as they all could, including the soon to be lamented Duane Allman on slide guitar. A great band around a great guitar player. He never made a better album since. David Bowie's breakthrough album in the U.K., not in The Netherlands. The album that made his reputation as a man who could do anything to make himself stand out, but, unlike others of the glamrock era, had the songs that stand time easily. Progrock is just not my thing, but this album definitely is an exception. With a fantastic song like 'Your's Is No Disgrace' or 'Starship Trooper' or 'I've Seen All Good People' on one album, a band can't go wrong. Everything simply fits and rocks, hard or is as gentle as a new born baby. The Who is the 60s band with a huge name that I have most trouble with digesting. It's sometimes simply too much of a perhaps good thing. On 'Who's Next' things do come together, with several famous singles that are all still played on the radio, right up to this day, of which 'Behind Blue Eyes' is perhaps the best rock ballad ever. Steely Dan's debut and almost it's best album. Most of the ingredients that made the band big were already there, with one main difference: the band allowed itself to rock. It's those songs that I love most on Can't Buy A Thrill..
You can find a full review of this album on this blog. Exile is the album made in exile in 1971. It's the band's most loose one, in which it goes off in several direction in rock, soul and blues. Not all songs are extremely strong, but with a B side like the one's on record one and two there's no way this album could not be mentioned here. I remember one of the songs being played on the radio and thinking: 'It's been years since I heard a new song by The Kinks'. As soon as I had saved up enough money I went out and bought it. My favourite The Kinks album right up to today. Ray Davies is moving towards his U.S. success sound with the band and does a great job in reminiscing his school days. A live album is allowed here, simply because several songs have totally different arrangements than the original ones of the 60s. I loved the album from day one and is the second Dylan album after 'Desire' that I owned. Now that is an album that I would have thought to make this list easily, but I decided to put 'Budokan' in first and was very strict afterwards. No 'Horses' for me in this list. This is my favourite Patti Smith album. She rocks out hugely and seemed on a winning streak, before she decided on another career as a married woman. 'Dancing Barefoot' is a great single. 'Frederick' a great love song and what to think of 'Citizen Ship'? What an impression this movie made on a 13 year old. The songs, the story, the songs, the songs. Right up to this day I can sing along to most of them. The album on which it all came together for Steely Dan and the blueprint of a sound that they never really changed since. The songs just got slicker and slicker. Here they are still authentic with the best collection of songs. Donald Fagen came close once as a solo artist in the early 80s. The album that holds the epic rock ballad of epic rock ballads. It also holds the best rock and roll song of the 70s and has some other things going on that make IV special in many ways. There's a full review on this blog to be found. Another album from the days that I discovered the LP Top 20 program on Tuesday afternoon in the fall of 1975. My first Lou Reed album and favourite right up to today. I had heard 'Berlin' first, but couldn't listen to it, like I still barely can. Reed is at his lightest here, but also finest. Deceivingly simple songs hold many a layer to discover. Yes, the first Stones album I owned, bought in the U.K. in the spring of 1976 for £ 2,69, believe it or not. Black and Blue is so extremely varied. My first exposure to reggae, to funk, a great ballad in the form of 'Memory Motel' and Jagger singing with his highest voice. I was so surprised at first. This was everything The Stones were not supposed to be and yet so good. The Doors' final album with Jim Morrison. There's a full review on this blog. This was my favourite album for years on end in the early 80s. Things have changed. It is still extremely good, but I play it considerably less, as in almost never in 2016. When I do, I'm still in awe though. An album that I did not know at the time. This is a mid-90s discovery, through bands like Teenage Fanclub and The Posies. #1 Record is absolutely fabulous. It may have some shortcomings productionwise, bit for the rest it holds so many beautiful songs that this album ought not to be missing in anyone's record collection who has a love for masterly pop songs. Darker, darker, darkest. On The Beach is Neil Young at is very best, except for 'Like A Hurricane'. The country and blues infused songs just seem to continue their path, except that all of Neil Young is in them. Heartfelt, extremely alive and depressed. This is a great album. 'Inca Roads'. Need I say more. This cut together song of a studio recording and a live guitar solo is so adventurous and one of the best songs ever. The rest of the album holds great songs as well. In some the weirdness is barely contained, but just enough to make them pleasant Zappa style. Others rock out in a fantastic way, including a song with Johnny 'Guitar' Watson. Station To Station is my second Bowie album after 'David Live'. The mix of outrageous rock songs, the jazzy ballads and early disco gives Bowie an album that is special, not just good. He never made a better album since, until this year that is. 'Blackstar' is monumental. La Hagen! I wrote all there is to write in a post on this blog. Break up and shake up. Blood On The Tracks lays everything bare and does so in a most attractive way. Dylan's best record easily, with some very memorable songs. This call is extremely close, but there's no 'Shine On You Crazy Diamond' on this album. Hence the small difference in position. The album received a review on this blog. Again a first album. This made such a huge impression on me. There are only two others, I think, that can compare. Hearing 'Franz Ferdinand' and 'Whatever People Say I Am I Am Not' for the first time. This album carries me away every time I hear it. 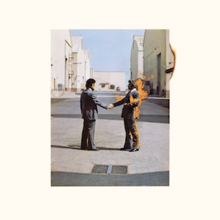 'Wish You Were Here' is one of the best albums made ever (with 'Dark Side Of The Moon'). 'Welcome To The Machine' is a real dip, though stylistically good, the rest makes up abundantly. P.S. Next up are the horrible 80s. Can I find 30 albums worth mentioning? (yes). Would they make an overall top anything? (most probably not). Is it a challenge to do? (yes).